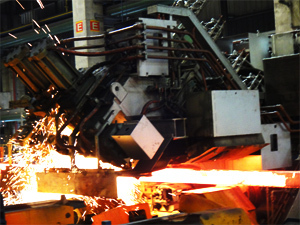 Increased production volume and stable operations become possible through high speed rolling technology. 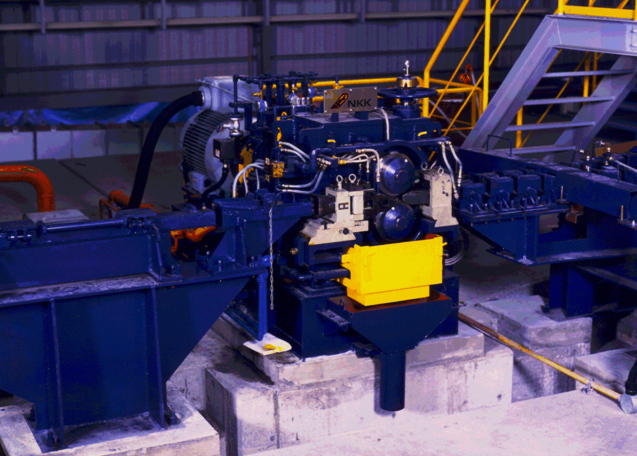 Using a block mill, which drives multiple rolling mills and has been used on 100m/s class wire rod lines, as the bar steel finishing mill, will achieve speeds far beyond the finishing speed of about 20m/s that was the limit of conventional mills. Rolling using ultra-hard rolls provides advantages such as precise measurements and enhanced surface finish.Additional advantages are easier roll exchange and maintenance. Ordinarily, shears were start-stop types, which began moving when the shearing point arrived. However, there was a limit to the speed of the blade rotation (shearing speed) because the blades went from a standstill then began rotation and acceleration. Continuous rotating shears were adopted for the HSDS system, enabling faster shearing speeds. This makes stable shearing possible at even faster rolling speeds. EBROS™ stands for Endless Bar Rolling System. Its objective is to enhance productivity and yield ratios. Simply put, the function of the EBROS™ is to weld the heads and tails of the billets that are extracted at constant intervals from a reheating furnace, and to create a billet of unlimited lengths. 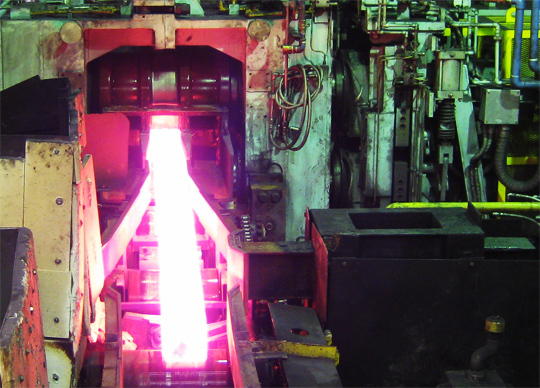 HDR (Hot Direct Rolling) is a system where the billet from a continuous casting facility is conveyed through roller table and directly input into a mill without being reheated. It is an excellent energy-saving technology. 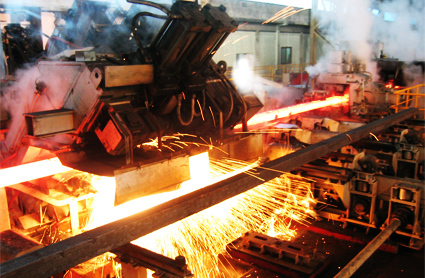 For the realization of this HDR system, comprehensive engineering capabilities for furnaces and continuous casting and rolling facilities are required. 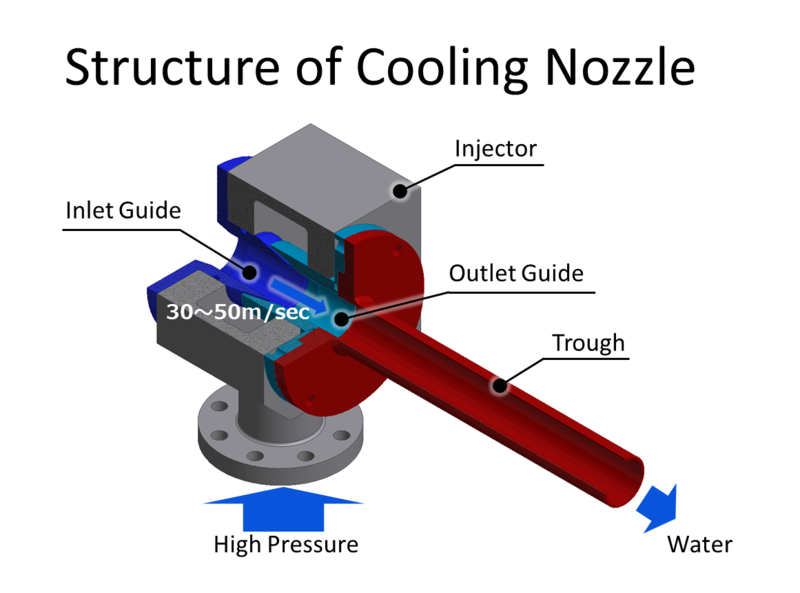 Such includes (1) high-temperature casting technology; (2) technology to minimize the temperature decrease; and (3) optimal layout for delivery to the next process. We, Steel Plantech, will make the utmost use of these comprehensive engineering technologies to meet our customers’ needs. 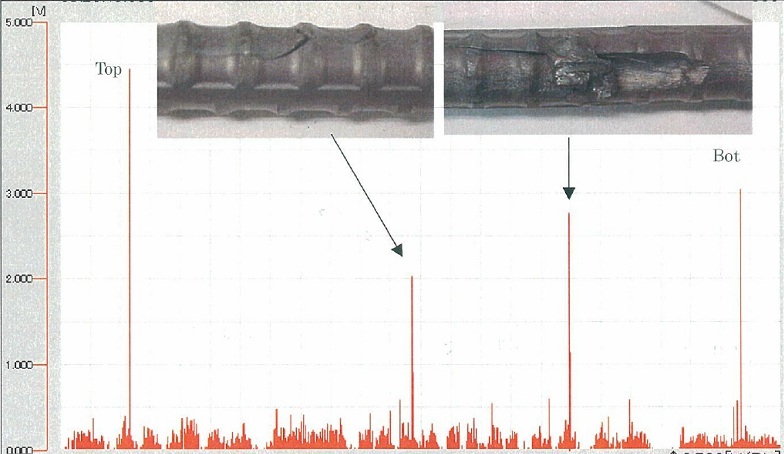 Placing a flaw detector immediately after the finishing mill has made it possible to track the position of surface flaws on special-form steel bar products. This enables operators to be notified of where that flaw ultimately is on the product, thereby making it possible to significantly reduce the mixing in of defective products. 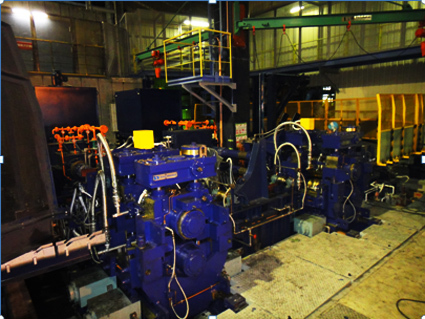 →The weight has been trimmed, creating the possibility that a larger stand can be adopted in the rolling mill yard where there is a limit on the crane capacity. →This results in a more balanced construction than when the lower portion of the rolling screw shaft is secured. →The same position is securely maintained even if a strong rolling reaction force is applied. →The area on the bearing that receives the pressure becomes wider, extending the life of the bearing. →Suitable for automated stand exchange. Multislit rolling methods include 2-slit, 3-slit, and 4-slit rolling.2–slit rolling is currently the mainstream method, providing stable quality and good measurement systems. Furthermore, even higher production efficiency can be achieved through speeding up technology. 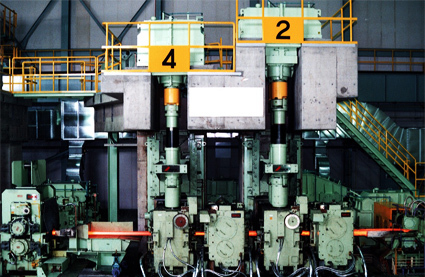 3-slit and 4-slit rolling allows production volume to be increased even with a small number of rolling mills. Slit rolling is also suitable for revamping a low productivity 2-slit line mill to a high productivity mill with greater production volume while keeping the number of rolling mills the same. The chockless stand does not have a chock, and has an extremely rigid structure. The mechanism makes it possible to adjust the spaces of the upper and lower rolls symmetrically with the pass line by using the worm screw to turn the eccentric sleeve that has been built into the roll axis.